During the 19th century, diamonds and other precious stones were set in either gold or silver. However, when the setting was silver, gold always formed the backing due to its strength and hardness. In fact, the majority of such pieces used 14-carat gold for backings, as opposed to the softer 18-karat gold. For these silver-topped settings, copper was preferred metal with which to alloy the underlying gold, resulting in a reddish appearance. The colour blended well with the silver and the metals fused together more evenly. With discoveries of large quantities of diamonds in Brazil and South Africa, jewellers began to create designs requiring more of these stones in all sizes. They soon realized that diamonds set side by side looked better when using a white metal, which needed to be soft and malleable to accommodate the bending of prongs over the stones. It also needed to join well with the underlying gold mounts. Silver was the obvious choice. But there was one main problem in that it tended to darken or tarnish over time, causing an unintended effect on designs. 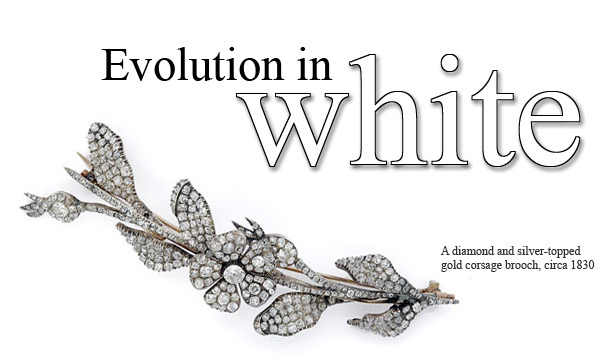 jewellery makers quickly learned to utilize this new white metal, which did not darken the way silver did. Further, platinum had other characteristics that could be exploited in jewellery designs. By the turn of the century, this precious metal made finely detailed jewellery resembling lacework possible and diamonds could now be held safely with prongs much thinner than if made with silver. Thus, diamonds could be set closer together than ever before. At first, platinum was very expensive and jewellery makers were satisfied to limit its use to settings, while the rest of the mounting was in yellow gold. But as the middle class fell in love with platinum and shunned both gold and silver, many forms appeared made entirely of platinum. The leading jewellery houses of the period concentrated their craft on making more intricate platinum pieces. As the First World War broke out, very little jewellery was being made or worn in Europe. Even in the United States, Congress passed laws severely restricting platinum‚Äôs use in jewellery so that it could satisfy the need for the metal in the manufacture of military planes. (It‚Äôs regrettable to admit, but wars do quicken technological advances in many fields.) Jewellers in the United States were conflicted by this lack of raw material for making their favourite designs and an alternative would need to be found. It had long been known that all metals are various shades of white, except copper and gold. However, none of the white metals offered the malleability of silver or platinum. Gold was known to be very malleable, but required various alloys to give it sufficient hardness for use in most jewels. The Belais brothers of New York City experimented with various alloys, eventually combining about 18 per cent nickel to a mix containing 75 per cent gold and seven per cent zinc and copper. This mix produced an alloy that resembled platinum‚Äî18-karat white gold. David Belais patented his new process in 1917 and he and his brother planned to supply the trade with this new alloy. Unfortunately it wasn‚Äôt to be, as it soon became apparent this metal was far more rigid than platinum and designs could not be as refined. The brothers developed a line of jewellery that essentially imitated the popular handmade platinum lacework jewels, but was made of one solid piece of metal and incorporated new synthetic sapphires that were available in abundance. Although it could be made much cheaper than platinum jewellery, it simply didn‚Äôt catch on. The jewellery-wearing class demanded platinum and as the war ended, so did the restrictions on its use. The 1920s were a decade marked not by frugality, but by ostentatious adornment. by fashioning the pins at the back of brooches out of the metal for rigidity‚Äôs sake. Since the main part of the jewel was made entirely of platinum, a pin back made from white gold was inconsequential. 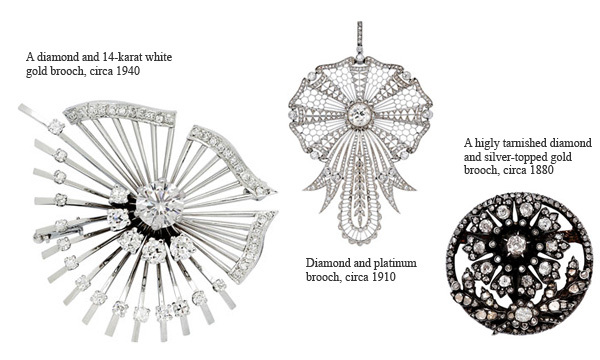 In fact, throughout the 1920s, virtually all brooches had white gold pins. Then came the crash of October 1929 and the Belais Brothers went out of business. Jewellers all over the world began utilizing their formula, along with various slight modifications not only in 18 karat, but also in 14 karat. The patent on the original formula was either not extended or became irrelevant in the 1930s and beyond. In fact, some white gold alloys included up to 10 per cent palladium. However, it stands to reason that any heirloom jewellery containing white gold in its main part must be made after 1917 and most probably after 1930. In fact, many of the old styles of the period from 1890 to 1910 have been reproduced in white gold, whereas the original would have been platinum. By the 1940s, it became fashionable to include white gold within the main part of jewels. Further, the various new formulas of the day were less rigid than the brothers‚Äô alloy. Since then, white gold has gone in and out of favour with consumers. The mid-1970s was one such very short period of favoring white gold for all types of jewellery and watches, but that faded by 1980. Another such period is now upon us. However, it may last much longer given the concurrent popularity of platinum for bridal and silver for masses of younger customers.